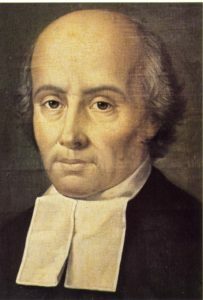 April 1819 : Death of Father Manoir, the first Vicar Capitular. We know that in January 1815, the Chapter of Saint-Brieuc had appointed three Vicars Capitulars, the Fathers Manoir, Boulard and Floyd, to whom, because of the great age of these last two, he had added the Secretary of the Bishop, Father Jean-Marie de la Mennais. In fact, only Father Manoir could be of any help to him. And now, on 20th April, after six days of illness, Father Manoir dies. 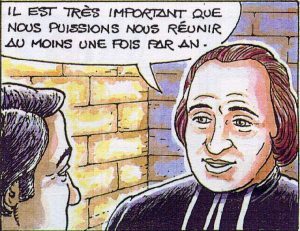 Father de la Mennais learns of it at Loudéac where he accompanies the Bishop of Vannes who begins a Confirmation tour planned for a long time. He hastily returns to Saint-Brieuc to preside over the funeral of the deceased. From now on, he will be really alone in carrying the weight of the diocese until the arrival of the new Bishop, not yet officially appointed. March 1819 : the concern, always present, of the education of the young people. 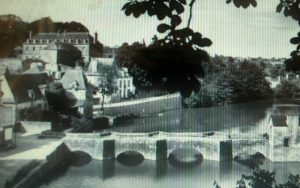 Appeal to Father Tresvaux. The Vicar Capitular does not forget the girls. To his brother-in-law, Ange Blaize, he says, on the 11th March: “I have just finished a business to which I attached a great deal of interest; it is a school for little girls like that of the Brothers; it has definitely settled this morning; we will have at Easter a school of 200 – 300 girls. This is the House of Providence at Saint-Brieuc. January 1819 : Daily worries of the Vicar Capitular. From the Colonel to the Prefect and to the Minister of the Interior, quarrel about a Military Mass. The embarrassments of the Vicar Capitular are of all kinds and he must intervene many times to satisfy the Colonel of the Legion who intends to get a Mass for his troupe on Sunday at noon in the Cathedral. “For reasons of public order,” the midday Mass on Sunday had been suppressed for ten months before the arrival of the new Colonel. The first two tickets of January 16th (morning and evening) signify to the Colonel that we are willing to satisfy his request and that in the absence of a regular Military Chaplain, the Vicar Capitular found him a Priest available to celebrate the Mass. at noon in the College Chapel. The Colonel refuses this proposal. 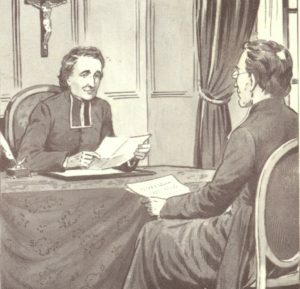 On the morning of Sunday, January 17th , Father Jean-Marie takes the pen to remind the Colonel that “no law or ordinance imposes on us to give the troops a special Mass and does not attribute to the Military Chiefs the right to fix the time and place where it would be said “and that he regrets the decision taken. The dispute goes back to the Prefect, because Tuesday, January 19th , the Vicar Capitular takes the pen to justify the decision that was in his competence. On March 17th , returning to this affair, which went back to Paris, Father de la Mennais informed the Minister of the Interior that, in the circumstances, he had only the concern to enforce the law and laws of the Church and that the intervention of the Prefect was beneficial. A note sent to the Colonel on September 29th shows that things are then well appeased. (See CGII, L846, 847, 848, L852, L864, L915). See also the letter of 2nd February to M. Querret (L852) where the Father alludes, not without irony, to the “red quarrel” he had with the Military. Eight days later, Ms Esther Beauchemin joined them by doing the same act of self-donation. 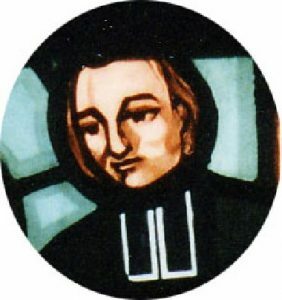 Miss Bagot, the fourth associate of the beginnings, was separated from her companions to continue her apostolate with the orphans and found the Congregation of the Holy Family. 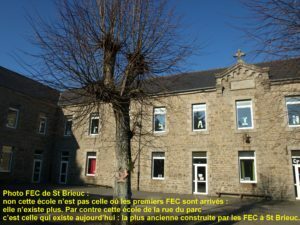 NOVEMBER 1818: Arrival of the Brothers of the Christian Schools at Saint-Brieuc. Battle of the Mutual School. A year and a half passed between Father de la Mennais ‘first step on May 19, 1817, in Father Deshayes’ annotated letter to the Superior of the Brothers of Christian Schools, and the long awaited arrival of three Brothers. It was time. Advocates of the mutual school had already succeeded in enrolling 175 children before three days later the Brothers began to receive the inscriptions. “The humble catalogue of the ignoramuses has quickly filled up, so that it contains at the moment more than 300 names … Of the 175 pupils enrolled for mutual teaching, only 50 appeared; the others are with the Brothers or will soon enter; the poor Lancastrian and his friends are enraged, they say; the people are in joy and I do not weep. “Wrote Father de la Mennais to his friend Querret. 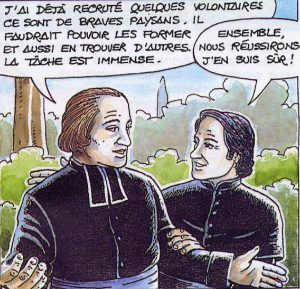 In a letter to the Minister of the Interior, Father de la Mennais explains the two fundamental reasons for his opposition to the mutual school: 1st, because I believe this method dangerous; 2nd because, in this country, it has as partisans only the enemies of God and the King. (Letter 817. OCTOBER 1818 : Jean-Marie de la Mennais settles down Rue Notre Dame, the future site of the Novitiate of Saint-Brieuc. Jean-Marie de a Mennais left the house on Rue Saint Gilles where he had lived since 1814 to come and settle in Rue Notre Dame, in the convent of Monbareil. He made an advance of 12,000 francs to the Sisters of Charity of the refuge to help purchase the convent, in return for a rental of a sector of the house for his personal use. He took charge of the education of his nephew, the “little Angel”, son of Marie and Ange Blaize, whom he brought back from Saint-Malo to return from his September visit in Paris. It was in this house that he received a few months later the first three subjects, among them Yves le Fichant, recruited by the Father Tresvaux, parish priest of La Roche Derrien. 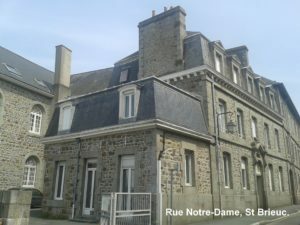 The Novitiate will operate at Notre Dame Street until its transfer to Josselin in August 1823. SEPTEMBER 1818 : Second retreat of the Brothers of Auray. Retreats of the laity. Let us leave the word to Brother Hippolyte Morin in his “Souvenirs”. “In the month of September, 1818, our Brothers, thirteen of them, again made their retreat with the Brothers of Christian Schools, at Maneguen. This time it was Fr. Guyomard, then curate of Malestroit, and then Missionary of St. Laurent, who gave instructions in one of the classes. The master’s desk was that of the preacher; the retreat resembled the preceding one: we rose at five o’clock and went to Father Deshayes’ room for the prayer and meditation that took place there. Summer 1818: rest, trips, deaths, stays in Paris, at la Chesnaie, of John and Féli. 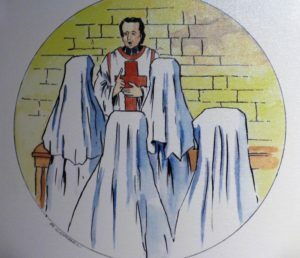 July 1818 : Understanding between Gabriel Deshayes and the Sisters of the Holy Spirit of Saint-Brieuc to benefit the future Sisters of Saint-Gildas. 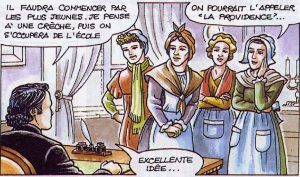 Since 1807, Gabriel Deshayes had brought a group of seven young ladies together at Beignon in order to make them teachers. A school for girls did open under the leadership of Michelle Guillaume, but their pedagogic and religious formation had to be provided. In view of this, Gabriel contacted the Daughters of the Holy Spirit in 1818, planning to join his group to that Congregation. 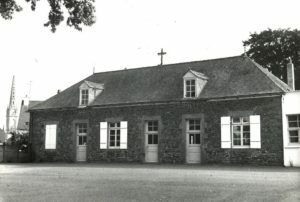 By way of trial, he chose Michelle Guillaume and one of her companions to join the Daughters at their Motherhouse in Plérin. However, in view of certain hesitations on the part of the sisters and the lack of unanimity of their general council, he went to Plérin and decided to terminate the trial. He returned to Beignon with his two disciples. novitiate. That date is retained as the foundation of the Congregation of the Sisters of Christian Instruction..
June 1818 : Death of Gratien, the youngest of the La Mennais family. The behaviour of Gratien, the youngest of the family, had for years been a permanent problem for the family. He lived on the hooks of his brothers and sister and spent his money on drinks and frivolities, leaving them unpaid bills to pay for him. Thanks to their intervention, he had obtained a post of lieutenant in a regiment of the National Guard in Tours, but was excluded in early 1818. 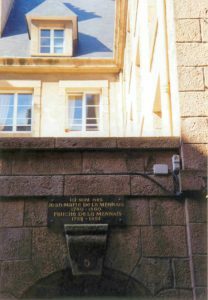 In December 1817, Jean-Marie had deemed it necessary to travel to Saint-Malo to study, with his brother-in-law, Ange Blaize, about the course of action concerning Gratien. They succeeded in getting him embarked on a ship of the Blaize armament for the West Indies, in second quality. On June 4, 1818, Gratien died, in Havana, of a vomit crisis caused by yellow fever. He was 33 years old. The news reached Brittany only in August. May 1818 : Urgency of the arrival of the Brothers: reminders to Brother Gerbaud, Superior General of the B.C.S. 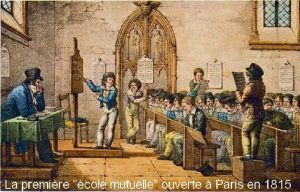 On May 5, 1818, Father de la Mennais resumed contact with Brother Gerbaud, Superior General of the Brothers of the Christian Schools, asking him, as promised, three brothers for October 1818 to counter the opening of the mutual school at Saint Brieuc. “Allow me to represent to you that it is very important that your brothers come in the month of October; I have believed, from what you have done me the honour of marking me, that I can assure the city, the Prefect, and through him to the Minister of the Interior, that our Christian schools would be established in this month. “. On June 15, the Vicar-General was even more pressing, and on August 22, September 13 and 25, he reported on the steps taken by Charles, B.C.S. 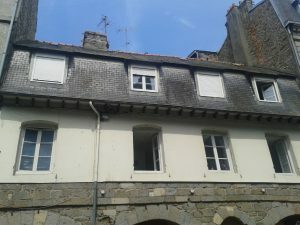 of Auray, which the Superior General sent to Saint-Brieuc to better account for the situation and to specify the needs for furniture and teaching diplomas. Brother Gerbaud then promised the Brothers for All Saints’ Day. On the 29th of November, 1818, practically the same year as the opening of the Mutual School. The commitment of the Vicar of Saint Brieuc to the service of his diocese remains total. March 1818 : Controversy with the Minister of the Interior on the four articles of 1682. In matters of dogma, the Pope is infallible only with the consent of the universal Church. As Vicar Capitular, Father de la Mennais was one of the first to open missions in his diocese. The first great mission was that of Saint-Brieuc in 1816, then Loudéac in 1817; that of Pordic began on January 1, 1818, and lasted three weeks. Father de la Mennais made the opening. 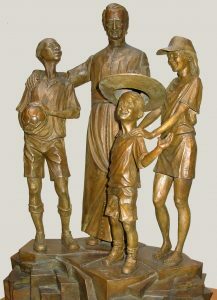 To consolidate the happy effects of the mission, Father de la Mennais obtained from Gabriel Deshayes brother Paul (Mathurin Guyot) to open a boys’ school. Mathurin Guyot was a native of Ploërmel and entered the novitiate of Auray on June 24, 1816. It was probably on the occasion of the Saint-Malo mission a few weeks earlier that Father de la Mennais negotiated this arrival, does not know the exact date. 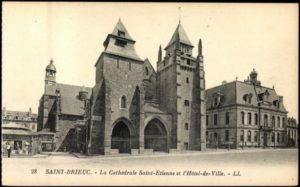 Brother Paul left Pordic in May 1820 to teach at the novitiate of Saint-Brieuc and in September to take the direction of Dinan where he remained until his death in 1853. He had the full confidence of our founder. The Brothers of Ploërmel held the Pordic school without interruption until 1978. See Ménologe, Volume 1, p 485, GC II, Letter 692 of 5 January 1818, EM 9, p 35. January 1818: Towards the end of the liquidation of the paternal business premises. On December 29, 1817, Jean-Marie wrote to his brother-in-law, Ange Blaize: “The liquidation is rapidly coming to an end.” This is the liquidation of the commercial counter of their father and uncle declared in the middle of the year 1813. Pierre Robert de La Mennais died on 24 January 1828 and the uncle of the Saudrais in mid-June 1829. At the end of 1817 an occasion for the third meeting for the two priests presented itself. 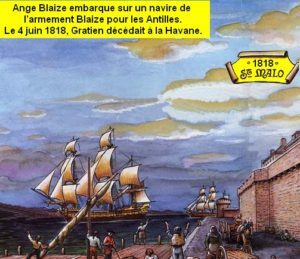 From the16th November to the19th December a mission was given to St Malo and St. Servan. The Assistance of Mr. Deshayes had been claimed by Augustin George, the pastor of Saint Servan. How could it be refused a friend who, during the Terror and in the middle of the worst dangers, shared his clandestine apostolate? The Vicar capitular had a project in view and which he kept in his heart. We think that he took advantage of this new meeting to accomplish it. In January 1818 the parish of Pordic was itself entering in the mission. To prolong the happy fruits, Father de la Mennais wished to rapidly open a school for boys. It was from Father Deshayes that he waited for the teacher he needed. Always disinterested, the parish priest of Auray promised to give him one. The desired class opened in the early months of 1818. EM 5, p 39-40 . CGI , L 606, L667 ; Crosnier I, p 284-288 . November 1817 : On the 30th of November, publication of the first volume of the Essay on indifference in matters of religion. 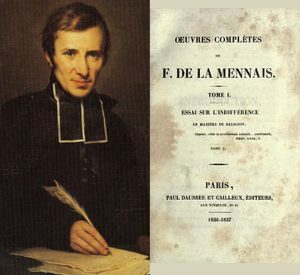 For some months now, Féli Mennais was writing a book of apologetics, on the pieces of advice and according to the personal notes that Father Teysseyrre, professor at St. Sulpice, had at his disposal and which dealt with indifference in matters of religion. On the 30th November 1817, in a letter to Jean Marie de la Mennais, Féli de la Lamennais announced that the printing of the essay was completed. It is a book of 560 pages, sold at 6 fr.50. The book was a great success and it was favourably welcomed everywhere, with some exceptions. In less than a year, 13,000 copies were sold. In 1818, it was translated into English, Dutch, and later in Italian, Spanish and German. The reputation of the Breton writer spread throughout Europe. But when the second volume appeared in 1820, critics kept more attention to the author. He also wanted to seek the judgment of Rome, which would prove favorable: “In the search for truth, we do not find in an individual man the principle of certainty: it is on the contrary, what men invincibly believe which constitutes the principle of certainty. In his “Essay” Lamennais highlights the strength of this common faith and, in my opinion, he does it with clarity. […] So, I think that this book is excellent and deserves publication. “(Rome, 29-04-1822 Basil Tomaggian, Penitentiary of St. Peter). General correspondence of Féli, Letters to Jean de la Mennais from No. 226 to No. 242 . Marechal , ” the infancy of la mennais “p 595 ff . October 1817. The first steps of the Daughters of Providence at the Grenouillère Street. After the mission of 1816 at Saint-Brieuc, the president of the Congregation of the young celibate ladies was elected. Anxious to devote themselves to good works, she accompanied in the first time Miss Corbio a devout parishioner of the cathedral in her charitable errands. Miss Corbion soon died. Miss Cartel then joined Marie Connan, Chaplain Annie and Miss Julie Bagot. Together, under the leadership of the latter, they founded, in a house called the “Grenouillère”, an institution for the orphaned. She sent four of them to start. Then, the four associates agreed that they would also receive children in order to teach them catechism and the basics of reading and writing … But Miss Bagot found that this new activity came from the original objective, exhausted, at its profit, the meager resources of the institution, and suggested the returning of the school children. 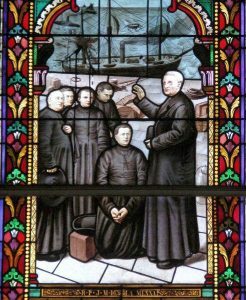 Father de la Mennais, sollicited as a referee, encouraged the two apostolate and Miss Bagot separated herself from her companions to continue, first alone, her ministry to the orphans. 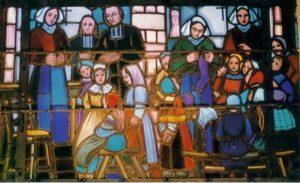 From there would be born two religious congregations: the Sisters of Providence of Saint- Brieuc and the Sisters of Our Lady of Providence, who later became the Religious of the Holy Family. AUGUST 1817. The retreat of the priests of the diocese of Saint-Brieuc. Father de la Mennais alerted the priests about the dangers of the mutual school. 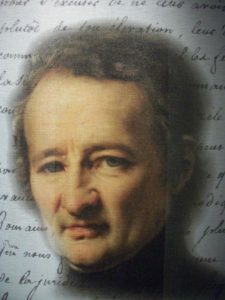 The diocese, under the leadership of Jean -Marie de la Mennais, organised two retreats for the clergy, the first in August and the second in September. The Vicar Capitular took the opportunity to draw the attention of the priests to the Carnot project, developed during the Hundred Days and advocating Lancasterian method. He warns against the dangers of the method and the ulterior motives of the designers (Doc 164, p 556 ) . Already on the 16th June, in a letter to the parish priest of Saint-Servan, Jean -Marie de la Mennais wrote: “The method itself is vicious: children are in perpetual movement. […] We boasted much about how quickly children learnt what they showed to each other […] but is [their] moral education ended?”. And in August, during a visit to the Trégor, he brings together the members of the Committee of Primary Education of Lannion and warns against the Lancasterian method and the opening of a mutual school at Lannion (L 629 ) . Two years later, the Father would develop in his pamphlet on the Mutuel teaching all the limitations and the real dangers of the method advocated by the government. He had already foreseen all this in 1817. Both retreats were also an opportunity for the Vicars Capitular to seek official retraction of the constitutional priests. All but one, the senior priest of Paimpol, would accept the regularisation of their situation, thus sealing the unity of the priests of the diocese. July 1817 : The signing of the new Concordat. 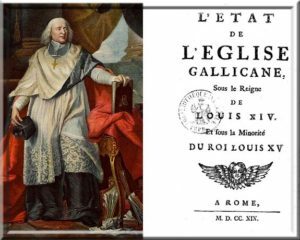 On the 11th June 1817, after three years of talks between the Ambassador of France to Rome and Cardinal Consalvi , on behalf of Louis XVIII and Pius VII, a new concordat was signed. It abrogated the one of 1801 and went back to the main provisions of the Concordat of 1516 with, however, some restrictions. This Concordat foresighted 72 dioceses including the restoration of Saint-Malo. Having not been validated, it was never effected and France therefore remained under the Concordat of 1801 until the law of separation of 1905. On the11th October, the final list of bishops appointed to vacant posts was issued. 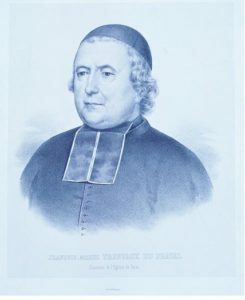 Bishop Groing de la Romagère was appointed to Saint- Brieuc, but he would only assume his responsibilities on November 15, 1819. Faced with the imminent appointment of the new bishop, the vicars capitular suspended a number of decisions. Cf CGI , L607 , 610, 611 . At the beginning of June 1817: second meeting between Gabriel Deshayes and Jean -Marie de la Mennais. 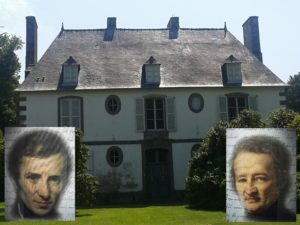 At the end of May or at the beginning of June 1817 (the General Correspondence of Jean-Marie de la Mennais between the 4th and the11th June had a vacuum), Father de la Mennais moved to Morbihan and saw, among others, Father Deshayes searching for three aspirants for the novitiate of the Brothers of Christian Schools, an indispensable condition for the Brothers to come to Saint-Brieuc. 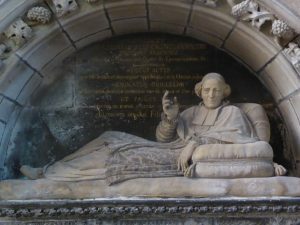 This visit ​​to Gabriel Deshayes shows the interest that Father de la Mennais had in the coming of the Brothers of Christian Schools at Saint-Brieuc. The three candidates requested for by the Brothers of Christian Schools entered the novitiate, the first one in July and the other two in September (CG II, L743 ) . Cf Laveille I, p 181, EM 5, p 38. 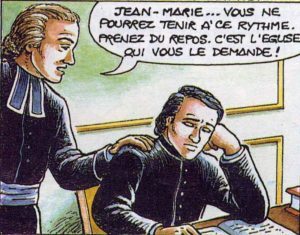 May 10, 1817 : Jean -Marie de la Mennais and Gabriel Deshayes met for the first time. This date situates the first meeting of our two founders. According to Brother Celestin Paul Cueff (EM No. 5), the Parish Priest of Auray, Gabriel Deshayes, Vicar General of Vannes and Father de La mennais, Vicar Capitular of Saint- Brieuc, knew each other’s reputation, would it not be by the press, especially “the friend of religion” that had published on the 1st June 1816 an article consecrated to the works of charity of the Parish Priest of Auray. Without further explanations, we must welcome these testimonies, and certainly recognise in them the finger of Providence that favoured this meeting so fundamental for the beginnings of our Congregation. On 6th June 1819: signing of the Treaty of Union by John Mary de La Mennais and Gabriel Deshayes. From the 9th to 20th September 20th, 1820: Grand Retreat of Auray in the presence of our two founders. On 6th June 2019, we shall celebrate the 200th anniversary of the signing of the “Treaty of Union” by our founders. 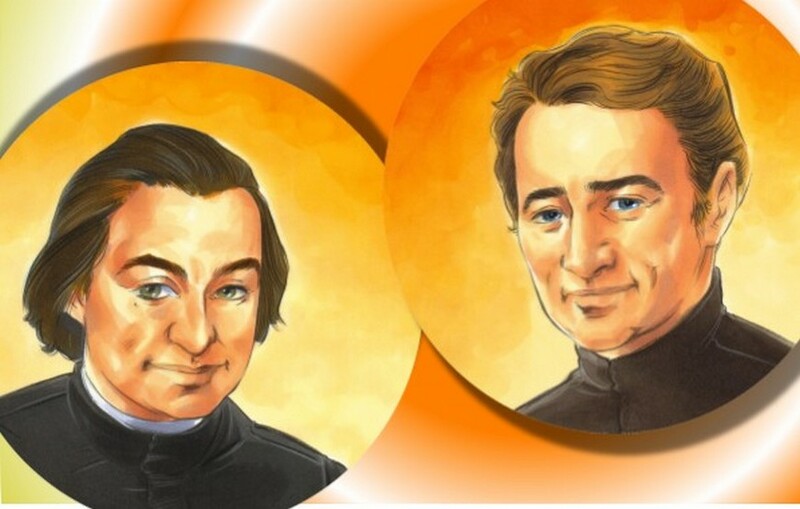 In September, 2020, it will be the celebration of the 200th anniversary of the 1st retreat of our first Brothers in the presence of both founders. On this occasion they received the first Rule, the cassock, the crucifix, the name: Brothers of Christian Instruction, and the motto: God Alone. We decided to celebrate this event by giving thanks for the past of our Congregation which, in spite of the trials, did not stop giving Brothers’ testimony together following Jesus, in the education of the little children and poor people. We shall also celebrate this anniversary with a new missionary spirit. That is why we chose the slogan: “a new page”. We wish that this celebration may be the opportunity to listen to the calls of the Spirit and go to new mission lands. Launching of the 1st year, with the theme: Discerning together. We shall try to follow our two founders who had tried, each on his side, to answer God’s calls, but who decided to make it together when it appeared to them that God had asked for it. This first year will prepare us directly for the General Chapter of March, 2018. Launching of the 2nd year, with the theme: Calling followers. We shall carry this fundamental question: what followers do we need, and for which mission? Launching of the year of the bicentenary, with the theme: Leaving for the mission. This year will end on 20th September 2020, anniversary of the closure of the retreat of Auray. So we shall try, during this year, to let ourselves be driven on the roads of the world, at the call of the Spirit.